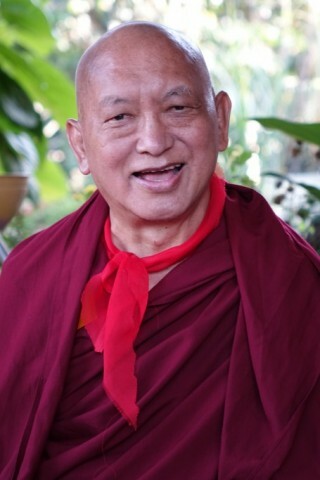 Lama Zopa Rinpoche, South India, January 2016. Have this translated into your native language by using our convenient translation facility located on the right-hand side of the page. French and Spanish speakers will find the FPMT International Office News translated each month in the “Bienvenue” and “Bienvenidos” tabs on the FPMT homepage! Lama Zopa Rinpoche with Khadro-la (Rangjung Neljorma Khadro Namsel Drönme), South India, January 2016. This year seems especially important for all of Rinpoche’s students to come together in some way to offer practice and prayers for Rinpoche’s long and healthy life. When I asked Khadro-la (Rangjung Neljorma Khadro Namsel Drönme) for her observation, Khadro-la answered with a deep concern and wish that all the students in all the centers, projects and services come together in some way and offer a long life puja to Rinpoche, as well as perform 100,000 tsog offerings. Khadro-la went on to explain how very important it is for Rinpoche to be present in this world for a long time, teaching and benefiting sentient beings in many different ways. Khadro-la talked about Rinpoche’s many special qualities, impressing how fortunate we are to have Rinpoche with us, guiding us in so many ways. The official annual long life puja will be offered to Lama Zopa Rinpoche at Amitabha Buddhist Centre, Singapore, on Sunday March 13, starting at 9 a.m. Singapore time (SGT; UTC +8:00). The puja and any teachings from Rinpoche will be livestreamed so all can participate. Donations are welcome. Please donate by March 10 if you would like your name included on the list of donors. Contact your local center or study group to participate in offering prayers and practices for the health and long life of Lama Zopa Rinpoche. 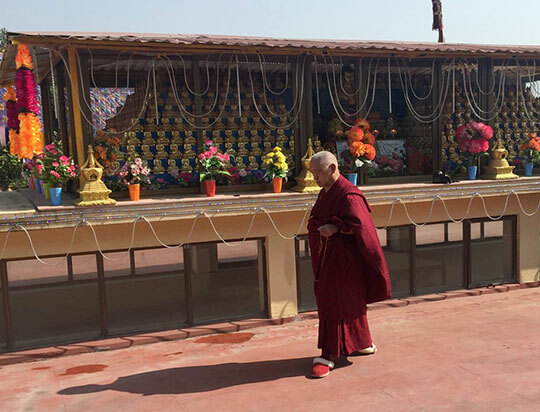 Lama Zopa Rinpoche doing korwa around 1,000 buddhas at Kopan Monastery, Nepal, December 2015. Keep up to date with Lama Zopa Rinpoche News and other blogs. Find a wide range of advice from Lama Zopa Rinpoche on Rinpoche’s Advice page. Newsflash! Lama Zopa Rinpoche will be teaching in India in February at Tushita Mahayana Meditation Centre, Delhi and Choe Khor Sum Ling, Bangalore. Watch our blog or Rinpoche’s Schedule online for details as they are confirmed. See the 2016 schedule in full. Please contact the hosts directly with any questions. Subscribe to our FPMT news blog to get updates as soon as they are announced. 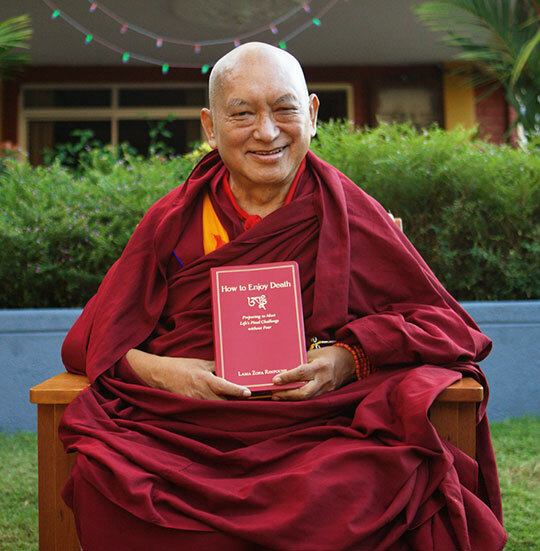 Rinpoche Available Now – Enjoy livestreams of many of the teachings above and recordings of Rinpoche’s most recent teachings! It’s the season to begin emptying Merit Boxes and donating your offerings! 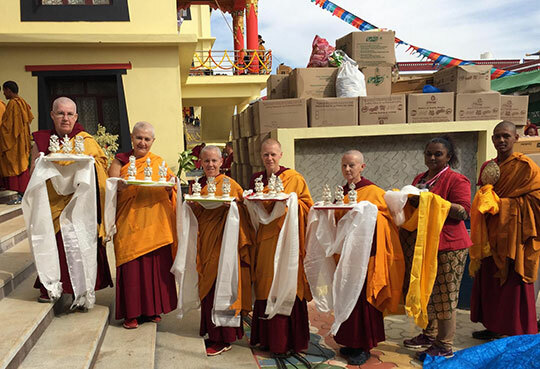 Donations will be used to provide grants this year to initiatives that work for the mission of FPMT – like Gendun Drubpa Center’s Stupa for World Peace – a Merit Box grant recipient in 2015. Not already a Merit Box practitioner? You can get a free Merit Box here or make a virtual Merit Box offering through our website. Geshe Thupten Jinpa, Portland, Oregon, US, May 2015. Have you already seen Mandala’s January-June 2016 online content? If not, we encourage you to check out two interviews now available online! In “Cultivating Compassion: Geshe Thupten Jinpa Brings Dharma into the Secular World,” Geshe Jinpa, a well-known Tibetan Buddhist interpreter, translator and scholar, discusses his new book, A Fearless Heart: How the Courage to Be Compassionate Can Transform Our Lives, and the development of Tibetan Buddhist practice in the West. And we talk with Swiss-born Ven. René Feusi, a well-respected FPMT registered teacher, in “Distilling Shantideva’s Bodhicharyavatara.” Ven. René shares how his book The Beautiful Way of Life, a distillation of Shantideva’s seminal work published by Wisdom Publications, came into existence and how to use it in one’s personal practice. Following Lama Zopa Rinpoche’s wishes, we have updated the text, Daily Meditation, which Rinpoche has renamed The Method to Transform a Suffering Life into Happiness (Including Enlightenment). This practice is also available in French. A new Basic Program Online subject, “Bodhisattva Deeds Part 2” is now available via the Online Learning Center. Additional support and materials have been added to the Kshitigarbha Practice section of the website, to help students fulfill advice from Lama Zopa Rinpoche that urgent practices need to be completed to help mitigate potential earthquakes in California, USA. A beautiful Shakyamuni Buddha card is now included in the Refuge and the Three Jewels booklet. In a recent survey, all respondents shared that they became Friends of FPMT to offer support to the Foundation, but how they use their Friends benefits varied. Some appreciated most the instant access to the prayers and practices, others took FPMT Online Learning Center courses or enjoyed reading Mandala magazine, and some supporters enjoyed them all! Learn more about this unique way to contribute to FPMT activities. This advice is specifically for those offering service in the roles listed above. We have put together the information you need to help your center, project, service and study group participate as requested in the practices for Rinpoche’s health and long life. 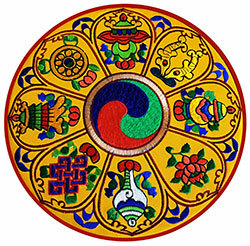 Lama Zopa Rinpoche advises that it is important for harmony and success for centers, projects and services to display sets of the eight auspicious symbols. It is very good to have one set in the gompa and one in the office. Of course, if you have room and want to have more, then the more the better! Rinpoche is very happy with the art of the round set pictured here. This and other styles are available to order from Kopan Monastery, Nepal, with a special discount for FPMT centers, projects, and services. 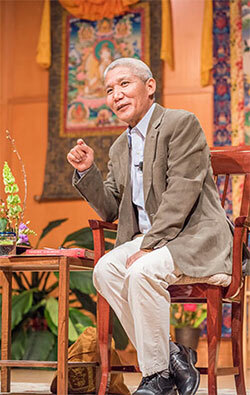 Geshe Lhundub Sopa’s Steps on the Path to Enlightenment Vol. 4: A Commentary on Tsongkhapa’s Lamrim Chenmo on Shamatha is now available through the Foundation Store. In this commentary, learn the principal techniques taught by the Buddha to develop mindfulness and stable and precise concentration. Enjoy a 15% discount for center classes and libraries! Promotion valid until February 15 using your FPMT wholesales account. 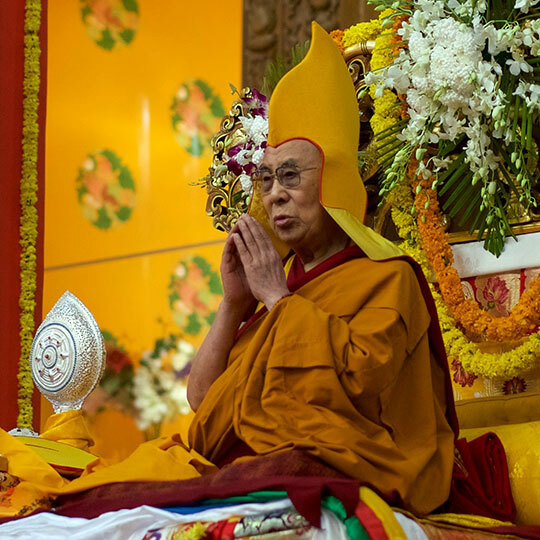 His Holiness the Dalai Lama with the silver Dharmachakra that was offered by Lama Zopa Rinpoche on behalf of FPMT, South India, January 2016. Photo courtesy of Jangchup Lamrim. Ven. Chantal, Ven. Paloma, Ven. Joan, Ven. Holly, Ven. Gyalmo and Dee Shekhar offering the silver ritual objects to His Holiness on behalf of FPMT, South India, January 2016. Support MAITRI Charitable Trust in its fight against leprosy in India on World Leprosy Day, January 31. Please check out the regularly updated meritorious opportunities to offer service as a volunteer or as paid staff in FPMT centers, projects and services around the world. In the USA, FPMT International Office is looking for a managing editor; both Milarepa Center and Vajrapani Institute are looking for land managers; and Land of Medicine Buddha has work study volunteer positions. In Australia, Chenrezig Institute needs a Basic Program teaching assistant. In New Zealand, Mahamudra Centre needs a center manager and Chandrakirti Centre has extended the application period for a new spiritual program coordinator. If you follow self-cherishing thoughts, those thoughts become your identity. Then anger, pride, the jealous mind – all this negative emotional stuff arises. When you let go of the I and cherish others, negative emotional thoughts do not arise. That’s very clear. Anger does not arise at those you cherish.